At Leap Motion, we’ve been amazed by how many people from around the world have been inspired by the possibilities of our technology. They want to free themselves, and the rest of us, from the current limitations of computing interfaces. 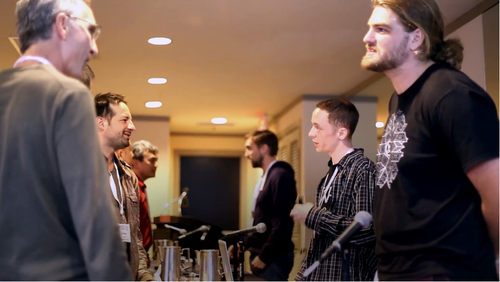 Last week, we joined many of these visionaries at the annual SF MusicTech Summit, which brings together some of the biggest names in the music, business, and tech scene together under one roof. An electric energy filled the air at Hotel Kabuki in San Francisco as my friends and co-workers, Isaac Cohen and Justin Schunick, joined me at the Summit. In different ways, Isaac and Justin have both been experimenting with expressive new ways to create and experience music. 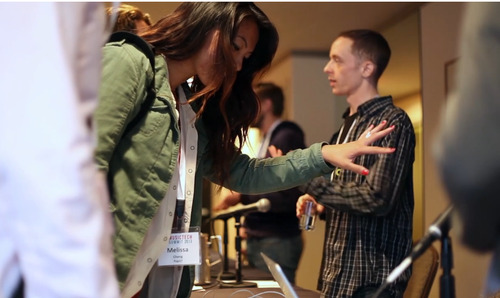 They were at the Summit to talk about their latest creations and demonstrate Leap Motion’s technology for an enthusiastic crowd of fellow music innovators. 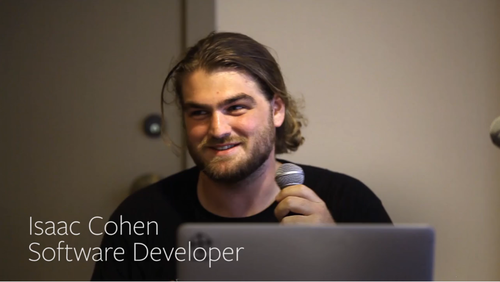 When Justin’s not holding a soldering iron, working on the inner workings of the Leap Motion Controller’s hardware, he’s experimenting with a new way of interacting with Ableton Live, a standard MIDI interface, and GeCo – a new Leap Motion app developed by Geert Bevin. With a standard MIDI interface, sounds can be created, distorted, bent, shifted and altered in a multitude of options through individual knobs and controls – but it’s a cumbersome process. Justin wants to change all that. GeCo lets you translate subtle movements of the hands into various audio channels. 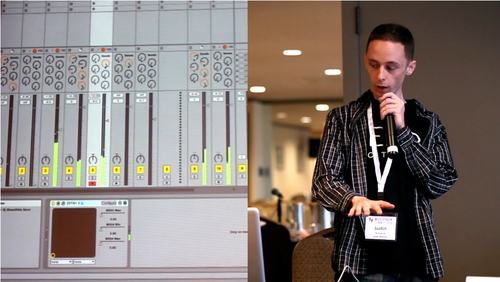 Justin demonstrated how he can use Leap Motion to control up to 18 different audio channels simultaneously through the natural movements of his hands – breaking down the barriers between him and the creative act of making music. Isaac, also known as Cabbibo when he’s creating jaw-dropping 3D visuals and soundscapes, demonstrated his explorations into the possibilities of navigating a live audio/visual 3D space. He’s created Universe of Sound, a “3D space exploration music blog” that links sound and visuals for a transcendent journey through the stars. Isaac and Justin freestyled the presentation, demoing concept after concept. Justin revealed how, with a few small tweaks to Ableton, he could turn the Leap Motion Controller into a virtual turntable – complete with vinyl scratching. 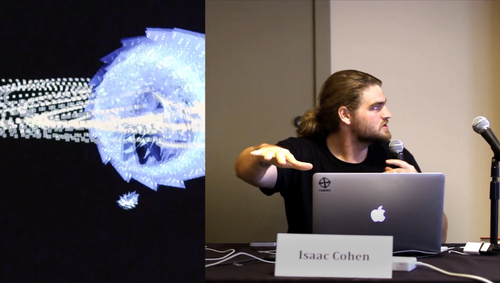 Isaac combined two devices on the fly to showcase how his 3D interactive visuals could be combined with Justin’s Ableton software to create an interactive sound and video visualizer. The session ended with a flood of questions, as well as many invaluable suggestions. We weren’t there to showcase our work, but to stimulate new ideas and allow other talented people to continue pushing this new wave of humanized technology. The barriers between people and technology are forever blurring, and we’re excited to be a part of that movement. 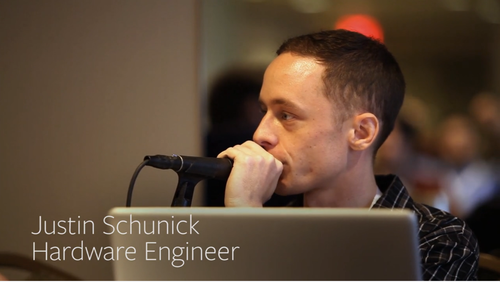 We’d like to hear what you think about how music creation can be transformed through a more natural human interface. What will the future sound like? How will digital music be created, manipulated, and experienced in 5, 10, 50 years? Post your thoughts below. Nicknamed after his home country’s national bird, Kiwi left New Zealand after three years of developing software to travel the world as a mega-yacht engineer. Later, Kiwi moved to San Francisco and earned his MBA.